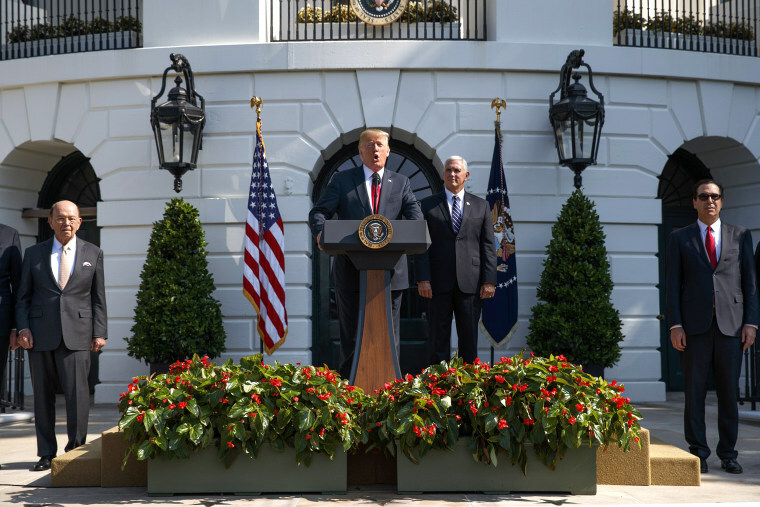 Strong economic growth handed Trump a message for the midterms. Will it work? Analysis: The president cited GOP tax cuts as driving the GDP growth, and he hit Democrats for wanting to hike taxes. The booming economy is very good for President Donald Trump and congressional Republicans — full stop. Sure, President Barack Obama had a few better quarters than the one that just ended, in which the economy grew at an annualized rate of 4.1 percent. And wages aren't growing. And, despite the good news, Trump felt the need to embellish the numbers when he spoke about them at the White House on Friday. But, in terms of politics, all of that is fine print. Trump can now cite the big growth number for at least the next three months as he barnstorms the country for Republican candidates in advance of November's midterm elections. It's exhibit A in his case that he'll need the GOP in continued control of both the House and Senate to sustain his success. In the statement delivered to TV cameras, Trump credited his tax cut — developed by the Republican Congress — with helping trigger economic growth. Though the relationship between the tax cuts and the second-quarter growth is unclear, he said Democrats would harm the economy by raising taxes. He noted not a single Democrat voted for the tax cuts. Expect to hear much more about that on the campaign trail, where Trump is traveling the country like he's on the ballot. And, in a way, he is. He knows that his agenda will be put on ice if Democrats win control of the House or the Senate in November — and that the battlefield for his re-election campaign will be set by the outcome of the midterms. Moreover, at a time when GOP candidates in swing states and districts have had to treat Trump carefully — trying to fire up his base without alienating moderates — the tax-cuts-drive-economic-growth narrative is powerfully unifying. So is the idea that Democrats are standing in the way of even greater growth that could be unleashed if taxes are cut further and more federal regulations are stripped away. Without signs of economic expansion, Trump's argument falls flat. With significant growth in the most recent quarter, he can portray the peril of Democrats winning in November as a threat to voters not just his own political standing. In North Dakota, where Democratic Sen. Heidi Heitkamp is trying to hold onto her seat in a state that Trump won by about three dozen percentage points, the Republican Party sent out an email Friday with the simple subject line "Heidi didn't want this." In case there was any doubt as to who benefits politically from the growth, Democrats were largely silent about it Friday. In a twitter thread, Senate Minority Leader Chuck Schumer, D-N.Y., pushed back on the idea that Americans are profiting from the Trump economy. "The GOP promised their tax bill would be 'rocket fuel' for the economy," Schumer wrote. "Instead, it blew up the deficit by a trillion dollars & sparked a surge in stock buybacks, benefiting the biggest corps, their execs & wealthy shareholders while leaving middle-class families largely behind." What he didn't mention over the course of six tweets was the 4.1 percent GDP growth number. Of course, the Commerce Department's report on the annualized quarterly growth of real gross domestic product is just one data point for voters in a sea of information — and one that will be overtaken by a new third-quarter number just before they go to the polls in November. History suggests that a president can get clobbered in the midterms even when the economy is going gangbusters — especially if stagnant wages only suggest a greater disparity between the fortunes of investors and laborers. GDP growth was 4.6 percent in the second quarter of 2014 and 5.2 percent in the third quarter that year, on an annualized basis. Still, Obama's Democrats got throttled at the polls, losing control of the Senate and enough House seats to give Republicans their biggest majority in nearly a century. "Growth numbers are too abstract," said Lis Smith, a Democratic strategist who has worked on presidential campaigns. "Voters care if their wages are up, expenses are down, schools are good and communities are safe." But at an absolute minimum, there's no downside for Trump and congressional Republicans in an economy that is suddenly growing at a faster clip. In the rosiest scenario for them, voters take the surge as evidence that Trump's policies are working and should be continued through the election of Republicans this fall. That, in turn, would give Trump two more years to govern with one-party rule before voters go to the polls in 2020. That's why Friday morning's report was so good for the president — and why it figures to be a key piece of his midterms message over the next three months.